Enjoy homelike comforts and a fantastic location when you stay at the President Abraham Lincoln Springfield a DoubleTree by Hilton Hotel. Savor a warm chocolate chip cookie upon arrival and enjoy impeccable service from our friendly staff. 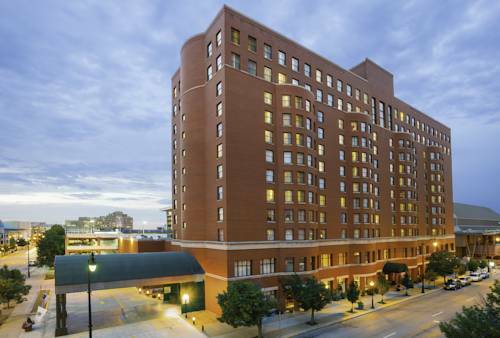 Set in historic downtown Springfield we offer easy access to the Prairie Capital Convention Center several corporations and popular Springfield attractions including the Abraham Lincoln Presidential Museum and Library The Dana Thomas House and Illinois State Capitol. A complimentary shuttle service is available to and from nearby AMTRAK and the Abraham Lincoln Capital Airport. Each beautiful guest room and suite at this hotel in Springfield IL offers a variety of modern amenities. Enjoy a restful sleep in the sumptuous bed and check emails with complimentary high-speed internet access. Host an important meeting seminar or wedding at this Springfield IL hotel with over 13 000 sq.ft. of flexible conference space and the latest in A/V technology. Catch up with work in the 24-hour business center offering a variety of useful services. Exercise in the 24-hour fitness center or swim lengths of the heated indoor swimming pool. Enjoy a family meal or a cozy dinner for two in the inviting Lindsay*s Restaurant serving delicious local specialties for breakfast lunch and dinner. In the evening sip hand-crafted drinks and premium draft beers in The Globe Tavern bar as you catch up on the news with the bar*s seven flat screen TVs. Reservations must be cancelled 1 day proir to arrival to avoid penalty. A late checkout fee equal to 1/2 of room rate charged until 4:00. A gawky "rail-splitter" rendition of Abe is the tallest tribute in a town bursting with Lincoln worship. Buy a token at the liquor store across the street, drop it in the coin box, watch out for the flame. Robert Wadlow stood nearly nine feet tall, so everything he wore or used had to be big. Most of it was destroyed by his mother after he died, but a few relics have survived to impress later generations of tinier humans.